Noonan Property has been exclusively appointed to offer for sale Level 9, 60 Park Street, Sydney via Public Auction on Tuesday, 16 April 2019 at 10.30am. Highly impressive whole floor commercial property Unequivocally one of the best strata floors in Sydney Prime corner positioning with large window frontages Blue ribbon location on Elizabeth and Park Streets Spectacular East facing views overlooking Hyde Park High ceilings throughout maximizing light and space Modern and stylish fitout with excellent natural light Internal kitchen, storage and bathroom facilities Efficient, regular and easily sub dividable floor plan Prominent corner building with development upside Impressive main lobby area with marble finishes Quality building services including recent lift upgrade Onsite Building Manager and common shower facilities Landmark location near Town Hall and Martin Place Walking distance to Sheraton Grand Sydney Hyde Park Close to popular restaurants, bars and cafes (Bambini) Within 100m of the new Pitt Street Metro Station Surrounded by an array of new CBD development Minutes to St James and Museum Train Stations Popular, prestigious and tightly held location SIZE AND LOT DETAILS Level 9, Lot 25 220 sqm approx. OUTGOINGS Strata levies $9,210 per quarter approx. Council rates $1,240 per quarter approx. Water rates $34 per quarter approx. AUCTION DETAILS Date Tuesday, 16 April 2019 at 10:30am Venue Auctionworks Centre, 50 Margaret Street, Sydney CONTACT DETAILS Tim Noonan 0416 286 129 Adam Droubi 0420 807 090 Noonan Property 02 9231 6000 DISCLAIMER The above information has been furnished to us by a third party. Noonan & Co Pty Ltd trading as Noonan Property have not verified whether or not the information is accurate and have no belief one way or another in its accuracy. We do not accept any responsibility to any person for its accuracy and do no more than pass it on. All interested parties should make and rely upon their own enquiries in order to determine whether or not this information is in fact accurate. Figures may be subject to change without notice. Noonan Property has been exclusively appointed to offer for sale Suite 3, 131 Clarence Street, Sydney via Public Auction on Tuesday 16 April 2019 at 10.30am. Quality commercial suite with refined finishes Contemporary, vibrant and inspired workspace Ultra high ceilings maximising light and space Large windows with attractive tree line views Exceptional fitout with custom built furniture Ferruccio Laviani designed pendant lighting Timber floors and full height glass partitioning Mixture of offices and open plan work spaces Impressive boardroom with audio visual display Large breakout space with kitchen & dishwasher CAT 6 cabling throughout plus Foxtel connection Balcony terrace spanning entire street frontage Directly accessible via the main building foyer Boutique commercial building with low Outgoings Striking main lobby with distinctive curved wall Prime location near Wynyard and Barangaroo Convenient to Circular Quay and Martin Place Surrounded by popular restaurants and bars Perfect opportunity for discerning investors LOT AND SIZE DETAILS Suite 3, Lot 3 176 sqm approx. Terrace space 12 sqm approx. Garden box 8 sqm approx. Total area 196 sqm approx. OUTGOINGS Strata levies $4,238 per quarter approx. Council rates $1,004 per quarter approx. Water rates $42 per quarter approx. 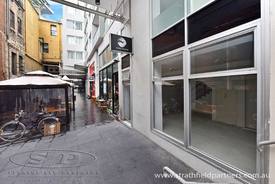 AUCTION DETAILS Date Tuesday, 16 April 2019 at 10:30am Venue Auction works Centre, 50 Margaret Street, Sydney CONTACT DETAILS Tim Noonan 0416 286 129 Adam Droubi 0420 807 090 Noonan Property 02 9231 6000 DISCLAIMER The above information has been furnished to us by a third party. Noonan & Co Pty Ltd trading as Noonan Property have not verified whether or not the information is accurate and have no belief one way or another in its accuracy. We do not accept any responsibility to any person for its accuracy and do no more than pass it on. All interested parties should make and rely upon their own enquiries in order to determine whether or not this information is in fact accurate. Figures may be subject to change without notice. Noonan Property has been exclusively appointed to offer for sale The Penthouse, Culwulla Chambers, 67 Castlereagh Street, Sydney . Commercial whole floor of unrivalled quality The Jewel in the Crown of Castlereagh Street Prestigious, sophisticated and distinguished Penthouse positioning with CBD skyline views Unique and exquisite atrium glass windows Glasshouse ceilings flooded with natural light Four expansive full height window frontages Ultra high ceilings maximizing light and space Timber floors and spot lighting throughout Interconnecting terrace perfect for entertaining Views overlooking King and Castlereagh Streets Full kitchen, bathroom and shower facilities Two separate titles providing excellent versatility Prominent and iconic landmark CBD building Striking main lobby area with stately finishes Highly coveted CBD location near Martin Place Surrounded by an array of new CBD development Enviable positioning on Sydney's 'Rodeo Drive' Minutes to Queen's Square and Hyde Park Close to Circular Quay and Wynyard station SIZE AND LOT DETAILS Level 12, Lot 49 198 sqm approx. 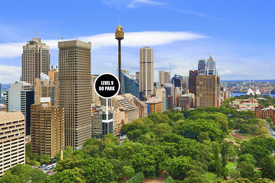 Level 12, Lot 61 156 sqm approx. Level 12, Common area 26 sqm approx. Total area 380 sqm approx. CONTACT DETAILS Tim Noonan 0416 286 129 Yann Le Berre 0449 286 129 Noonan Property 02 9231 6000 DISCLAIMER The above information has been furnished to us by a third party. Noonan & Co Pty Ltd trading as Noonan Property have not verified whether or not the information is accurate and have no belief one way or another in its accuracy. We do not accept any responsibility to any person for its accuracy and do no more than pass it on. All interested parties should make and rely upon their own enquiries in order to determine whether or not this information is in fact accurate. Figures may be subject to change without notice. Noonan Property has been exclusively appointed to offer for sale Suite 705 706 and Car Space 88, 50 Clarence Street, Sydney. Two adjoining office suites and one car space Three separate titles offering excellent flexibility Contemporary, impressive and vibrant workspace Expansive dual East and West window frontages Large windows providing excellent natural light Views overlooking Clarence Street and Barangaroo Adaptable fitout with custom joinery included Mixture of offices and open plan work spaces Direct and prominent lift lobby exposure Modern and stylish commercial building Striking main lobby with ultra high ceilings Onsite shower and change room facilities Excellent building services including three lifts Enviable location near Wynyard and Barangaroo Adjoining new entranceway to Wynyard Station Close to Circular Quay, Martin Place and KSW Surrounded by popular restaurants and bars Perfect opportunity for discerning investors LOT AND SIZE DETAILS Suite 705, Lot 45 81 sqm approx. Suite 706, Lot 44 76 sqm approx. 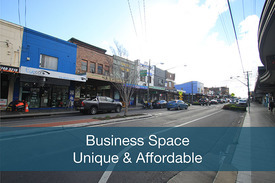 Car Space, Lot 88 13 sqm approx. Total area 170 sqm approx. OUTGOINGS Strata levies $6,209 per quarter approx. Council rates $741 per quarter approx. Water rates $356 per quarter approx. Car park levies $610 per quarter approx. CONTACT DETAILS Tim Noonan 0416 286 129 Yann Le Berre 0449 286 129 Noonan Property 02 9231 6000 DISCLAIMER The above information has been furnished to us by a third party. Noonan & Co Pty Ltd trading as Noonan Property have not verified whether or not the information is accurate and have no belief one way or another in its accuracy. We do not accept any responsibility to any person for its accuracy and do no more than pass it on. All interested parties should make and rely upon their own enquiries in order to determine whether or not this information is in fact accurate. Figures may be subject to change without notice. 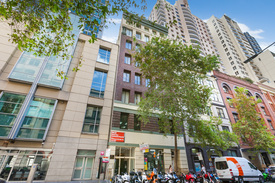 Noonan Property has been exclusively appointed to offer for sale Suite 202, 234 George Street, Sydney. Premium commercial suite in enviable location Impressive, efficient and inspired work space Prime positioning in an acclaimed CBD building Large windows providing excellent natural night Expansive views overlooking George Street High quality fitout with custom joinery included Mixture of offices and open plan work spaces Arguably Sydney's best commercial strata building Striking main lobby area with high spec finishes Excellent building services and low Outgoings Landmark location in Sydney's core financial hub Close to Wynyard, Circular Quay and Barangaroo Minutes to Royal Botanic Gardens and Martin Place Direct access to the remodeled George Street and Light Rail Surrounded by billions of new CBD development Walking distance to Barangaroo and Martin Place Popular, prestigious and tightly held precinct Perfect opportunity for discerning investors LOT AND SIZE DETAILS Lot 39 SP68112 Suite 202 95 sqm approx. OUTGOINGS Strata levies $2,506 per quarter approx. Council rates $521 per quarter approx. Water rates $28 per quarter approx. CONTACT DETAILS Tim Noonan 0416 286 129 Adam Droubi 0449 286 129 Noonan Property 02 9231 6000 DISCLAIMER The above information has been furnished to us by a third party. Noonan & Co Pty Ltd trading as Noonan Property have not verified whether or not the information is accurate and have no belief one way or another in its accuracy. We do not accept any responsibility to any person for its accuracy and do no more than pass it on. All interested parties should make and rely upon their own enquiries in order to determine whether or not this information is in fact accurate. Figures may be subject to change without notice. Prestigious commercial or professional suite Immaculately presented with elegant finishes Large windows providing plenty of natural light High ceilings with pendant lighting throughout Mixture of executive offices or consulting rooms Easily sub dividable with two entrance points Excellent aspect overlooking Castlereagh Street Iconic CBD building with classic Heritage features Imposing main lobby area with stately finishes Excellent building services including three lifts Enviable positioning on Sydney's 'Rodeo Drive' Surrounded by billions of new CBD development Close to Circular Quay, Wynyard and Martin Place Minutes to Queen's Square and Hyde Park Blue ribbon location opposite the MLC Centre Quality opportunity for investors and occupiers LOT AND SIZE DETAILS Suite 308 309 Level 3 Lot 18 SP46528 55 sqm approx. CONTACT DETAILS Tim Noonan 0416 286 129 Yann Le Berre 0449 286 129 Noonan Property 02 9231 6000 DISCLAIMER The above information has been furnished to us by a third party. Noonan & Co Pty Ltd trading as Noonan Property have not verified whether or not the information is accurate and have no belief one way or another in its accuracy. We do not accept any responsibility to any person for its accuracy and do no more than pass it on. All interested parties should make and rely upon their own enquiries in order to determine whether or not this information is in fact accurate. Figures may be subject to change without notice. Prestigious commercial or professional suite Penthouse positioning and extra high ceilings Superbly presented with excellent natural light Basement storage unit on separate title included Freshly painted and new carpeting throughout Excellent aspect overlooking Castlereagh Street Cityscape views of MLC Centre and CBD skyline Iconic CBD building with classic Heritage features Imposing main lobby area with stately finishes Excellent building services including three lifts Enviable positioning on Sydney's 'Rodeo Drive' Surrounded by billions of new CBD development Close to Circular Quay, Wynyard and Martin Place Minutes to Queen's Square and Hyde Park Blue ribbon location opposite the MLC Centre Quality opportunity for investors and occupiers LOT AND SIZE DETAILS Suite 1010, Level 10, Lot 8 25 sqm approx. Basement Storage, Lot 113 6 sqm approx. Total area 31 sqm approx OUTGOINGS Strata levies $1,293 per quarter approx. Council rates $358 per quarter approx. Water rates $14 per quarter approx. CONTACT DETAILS Tim Noonan 0416 286 129 Yann Le Berre 0449 286 129 Noonan Property 02 9231 6000 DISCLAIMER The above information has been furnished to us by a third party. Noonan & Co Pty Ltd trading as Noonan Property have not verified whether or not the information is accurate and have no belief one way or another in its accuracy. We do not accept any responsibility to any person for its accuracy and do no more than pass it on. All interested parties should make and rely upon their own enquiries in order to determine whether or not this information is in fact accurate. Figures may be subject to change without notice. Internal 72m2 with 4 partitioned offices and 18m2 of 1 car space and storage Premium fit outs Minutes to Town Hall, Museum, Courts, Chinatown and Darling Harbour 87 Liverpool Street is the commercial section of the prominent World Tower complex and adjacent to the prestigious World Square retail and commercial development. High quality finishes include three lifts, security access, separately air conditioned suites with intercom, male and female amenities and common kitchen. Access to the luxurious World Tower recreational facilities. Please contact Nicholas on 0418 115 776 for inspection. Noonan Property has been exclusively appointed to offer for sale Level 12, Chanel Building, 70 Castlereagh Street, Sydney. Spectacular whole floor commercial penthouse The Jewel in the Crown of Castlereagh Street Light filled with two expansive window frontages Enviable building with prime corner positioning Prominent and attractive views of Hyde Park Overlooking King Street and the CBD skyline Blue ribbon location opposite the MLC Centre Recently renovated commercial fitout included Mixture of exec office and open plan workspaces Impressive reception area and client boardroom Exclusive on floor kitchen and bathroom facilities Efficient and easily sub dividable floor plan Prestigious building with stunning new façade Contemporary main lobby with marble finishes Prime positioning on Sydney's 'Rodeo Drive' Famous CHANEL flagship store at street level Close to Martin Place and Queen's Square Minutes to Circular Quay and Wynyard Station Truly unique and irreplaceable opportunity First time offered in circa 25 years SIZE AND LOT DETAILS Level 12, Lot 30 163 sqm approx. OUTGOINGS Strata levies $4,250 per quarter approx Council rates $587 per quarter approx Water rates $34 per quarter approx Land tax SULV 2017 $280,000 CONTACT DETAILS Tim Noonan 0416 286 129 Yann Le Berre 0449 286 129 Noonan Property 02 9231 6000 DISCLAIMER The above information has been furnished to us by a third party. Noonan & Co Pty Ltd trading as Noonan Property have not verified whether or not the information is accurate and have no belief one way or another in its accuracy. We do not accept any responsibility to any person for its accuracy and do no more than pass it on. All interested parties should make and rely upon their own enquiries in order to determine whether or not this information is in fact accurate. Figures may be subject to change without notice. Noonan Property has been exclusively appointed to offer for sale Level 10, Culwulla Chambers, 67 Castlereagh Street, Sydney. Stunning commercial floor of unrivalled quality Prominent, distinguished and inspired workspace Highly coveted CBD location near Martin Place Meticulously renovated with refined interiors High exposed ceilings maximising light and space Light filled with 4 expansive window frontages Views overlooking King and Castlereagh Streets Exceptional fitout included with bespoke finishes European timbers and spot lighting throughout Mixture of exec office and open plan workspaces Two ultra impressive client meeting/boardrooms On floor kitchen, bathroom and shower facilities Secure basement storage unit on a separate title Iconic CBD building with classic Heritage features Striking main lobby area with stately finishes Blue ribbon location opposite the MLC Centre Enviable positioning on Sydney's 'Rodeo Drive' Handy to Centrepoint Tower and St James Station Minutes to Queen's Square and Hyde Park Close to Circular Quay, Wynyard and Martin Place Rare opportunity for investors and occupiers SIZE AND LOT DETAILS Level 10, Lot 26 398 sqm approx. Basement Storage, Lot 32 2 sqm approx. Total area 400 sqm approx. CONTACT DETAILS Tim Noonan 0416 286 129 Yann Le Berre 0449 286 129 Noonan Property 02 9231 6000 DISCLAIMER The above information has been furnished to us by a third party. Noonan & Co Pty Ltd trading as Noonan Property have not verified whether or not the information is accurate and have no belief one way or another in its accuracy. We do not accept any responsibility to any person for its accuracy and do no more than pass it on. All interested parties should make and rely upon their own enquiries in order to determine whether or not this information is in fact accurate. Figures may be subject to change without notice. This office is located in the World Square building on the corner of George and Liverpool Streets. Features: Two strata lots combined Well partitioned Bright and spacious Both suites currently under short term lease Bus stop at door step Well established shopping centre on the ground floor Would suit an owner occupation or investor. Unique commercial whole floor offering Impressive space overlooking Kent Street Sub penthouse positioning and excellent light Four sided window frontage plus balcony access Two separate titles providing excellent versatility Efficient and easily sub dividable floor plan Mixture of exec offices and open work spaces Impressive reception area and large boardroom Internal kitchen and on floor bathroom facilities Boutique commercial building with two lifts Well maintained building with low Outgoings Popular location in major growth precinct Close to Wynyard, Town Hall and Barangaroo Surrounded by billions of new CBD development Exciting opportunity in tightly held location SIZE AND LOT DETAILS Lot 13, Level 6 165m2 approx. Lot 14, Level 6 181m2 approx. Common area 14m2 approx. Total area 360m2 approx. OUTGOINGS Council Rates $7,367 per annum approx. Strata Levies $23,613 per annum approx. Water Rates $486 per annum approx. CONTACT DETAILS Tim Noonan 0416 286 129 Yann Le Berre 0449 286 129 Noonan Property 02 9231 6000 DISCLAIMER The above information has been furnished to us by a third party. Noonan & Co Pty Ltd trading as Noonan Property have not verified whether or not the information is accurate and have no belief one way or another in its accuracy. We do not accept any responsibility to any person for its accuracy and do no more than pass it on. All interested parties should make and rely upon their own enquiries in order to determine whether or not this information is in fact accurate. Figures may be subject to change without notice. Exclusively presented by Drake Property, this premier World Square commercial suite offers a rare opportunity to both owner occupiers and astute investors to tap into one of the most vibrant business hubs in Sydney CBD. 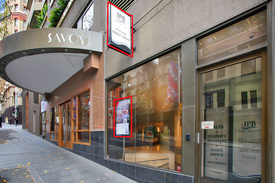 It features: 51m2 open plan space Expansive glass windows overlooking World Square Shopping Mall and George Street Lease expires end of September 2019 Glass walls with great exposure Shower in common area Location The property is located towards the western end of George Street in the World Square complex on the corner of George and Liverpool Streets. Town Hall and Museum train station and the Law courts are all located in the immediate vicinity. Description 650 George Street is a new five level building, part of the prestigious World Square retail and commercial development. High quality finishes include two lifts, security access, male and female amenities with shower facilities. Please call Sam on 0408 422 771 for more information or inspection. Spectacular whole floor commercial property Highly coveted location near Circular Quay Classic New York warehouse style features Sophisticated work space with high end finishes Extensive window frontages with tree line views Ultra high ceilings maximising light and space Exposed services and suspended lighting High quality and versatile fit out included Mixture of offices and large open work spaces Full kitchen, bathroom and shower facilities Dual entranceways and easily sub dividable Four secure car spaces on title included Direct lift access from car park to the suite Prestigious and iconic commercial building Striking main lobby area with high spec finishes Blue ribbon northern CBD location near Wynyard Surrounded by billions of new CBD development Minutes to Barangaroo and Martin Place Surrounded by popular restaurants and bars Quality opportunity for investors and occupiers SALE PROCESS Expressions of Interest closing 11am AEST Wednesday 11 July 2018 CONTACT DETAILS Tim Noonan 0416 286 129 Jonathon Bull 0449 286 129 Noonan Property 02 9231 6000 DISCLAIMER The above information has been furnished to us by a third party. Noonan & Co Pty Ltd trading as Noonan Property have not verified whether or not the information is accurate and have no belief one way or another in its accuracy. We do not accept any responsibility to any person for its accuracy and do no more than pass it on. All interested parties should make and rely upon their own enquiries in order to determine whether or not this information is in fact accurate. Figures may be subject to change without notice.